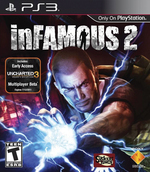 inFAMOUS™ 2 is the 2nd chapter in one of the best selling franchises for the PS3™ system. Blamed for the destruction of Empire City and haunted by the ghosts of his past, Cole must make a dramatic journey to discover his full super-powered potential and face the final confrontation with a dark and terrifying enemy from his own future. A huge improvement over its flawed predecessor, InFamous 2 injects more variety, personality and explosive fun into the first game’s promising formula, while removing or fine-tuning its most irritating problems. The more I played Infamous 2, the more I found myself disengaged with the story, instead enjoying the experience solely for its amazing open-world superhero fights. The game sacrifices its narrative flow for more fantastic elements. This isn’t a necessarily a bad thing; it just ends up being more about the action and random moments than Cole’s journey. inFamous, praised for spawning an impressive new breed of super-hero in the electrically-charged Cole MacGrath and then creating an extravagantly designed open-world city for him to ply his trade, was one of those games that demanded a sequel. 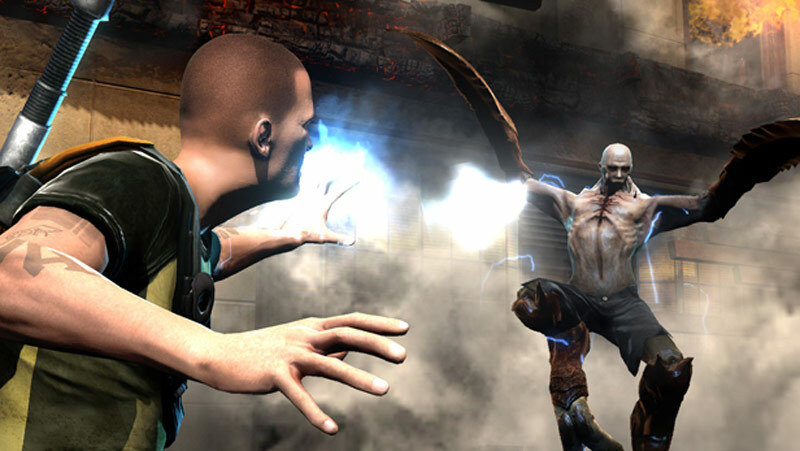 Stereotypically, sequels are never as impressive as their originals, but inFamous 2 improves in many areas to deliver a smooth-flowing, enjoyable and explosive ride. Pacing issues sap away much of your motivation to see what happens next, and poorly balanced combat encounters turn explosive action sequences into frustrating drags. Although there are still plenty of enjoyable moments that conjure blissful memories of the original game, a number of small flaws make for an uneven experience. 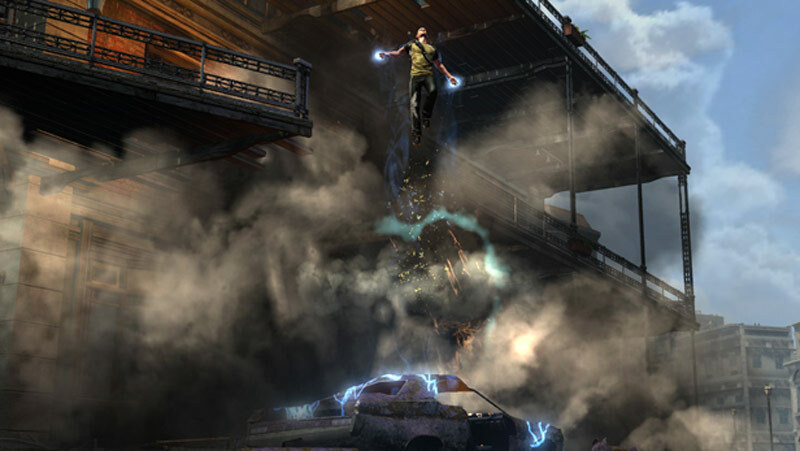 Infamous 2 proves just how difficult it is to capture lightning in a bottle. It can be hard at times to live up to the hype fans create for a game's sequel. Too often, I have seen excellent games fail miserably going into their second installment. No matter the reason, the second entry in a game determines the overall future of a franchise. Thankfully, inFAMOUS 2 delivers. Sucker Punch uses an "if it ain't broke don't fix it" mentality to deliver a truly electrifying sequel that dares anyone not to become a fan. Infamous 2 does just enough new to avoid the dreaded 1.5 tag that we so often use in our community. Perhaps it is a testament to the fact the first game was really that good. I expected more new stuff but the minor enhancements to the gameplay are welcome and do make a difference. I should warn you though, if you want everything from Infamous’ 2 story I highly recommend that you play and finish the first game before starting out with this one. 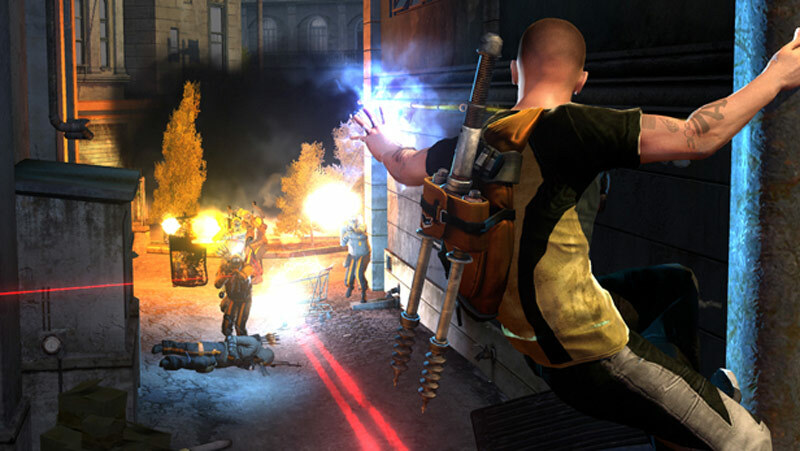 Infamous 2 excels with a varied open world, bookended by monumental set-piece battles. The inclusion of user-generated content constitutes almost as a game unto itself, and while the morality system isn't one that calls for tough decision making, it pushes even further to provide two dramatically different gameplay experiences. While it isn't an Uncharted beater, strong advances in the visual area with polished, spectacular presentation and a boost to the all important fun-factor make this a must play for PlayStation fans. It absolutely deserves to be up there with the console's best exclusives. Story and character, combat, environment, enemy AI, the powers, and visual polish all receive an upgrade in this iteration. 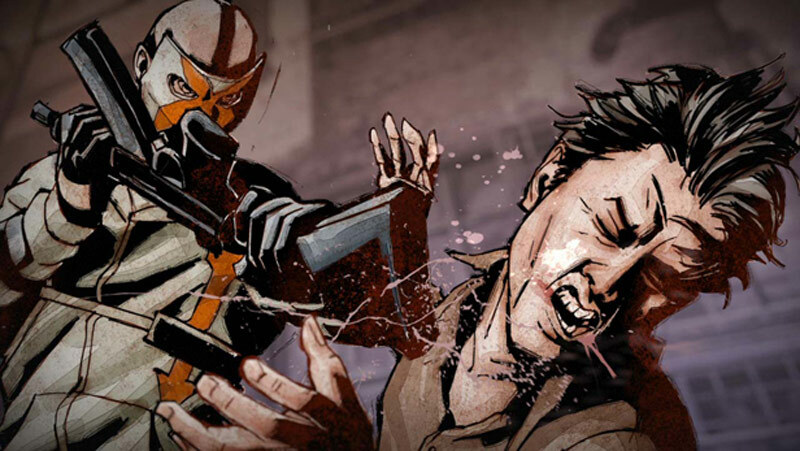 Sucker Punch is to be commended for remaining true to the strengths of the original while giving Cole a real sense of progression through the core gameplay. While stopping just shy of being truly jaw-dropping, I was well entertained, and I am pleased to declare that this game is a worthy evolution for the franchise. When combined with how well-executed just about everything in the game is, the overall package is one of PlayStation 3’s best and a must-play for fans of the first game. Don’t be deceived by niche subject matter like I was when the original Infamous first came out. This is a rock-solid third-person action game with an incredible story, great characters, meaty gameplay and – above all else – a string that effectively ties everything together. To be fair, Infamous 2 is a game of two halves, only one of which is horrible. The first, which sees the game methodically set its agenda, is actually pretty good. The murky and misty New Marais is a much better place for the series’ murky and misty in-game palette, not to mention a melting pot of bustling pedestrians. Infamous 2 improves upon the original in nearly every way with a fantastic setting and great mechanics but the story just wasn't quite a home run. Definitely worth a buy, if only to skate around New Marais and toss some cars. And shoot guys with lightning. And beat up bucket drummers. Parallels have been made between Naughty Dog and Sucker Punch for some time, and their work seems to follow a similar pattern. While Uncharted: Drake’s Fortune and the original inFamous were certainly great games, they had their own share of little flaws. But it was their sequels that truly showed where the vision would shine. By making the game world feel alive, and having all the elements of the game underline the true meanings of choice and decision, inFamous 2 is a masterpiece of game design and execution. inFamous 2 takes the flawed brilliance of its predecessor and improves upon almost every aspect. Missions are slightly more varied and characters are much more rounded. It breeds empathy and it encourages experimentation in the ways supporting characters play off the protagonist and each other. UGC is certainly not the killer feature this series needed to emerge from its slightly ropey footing, and while inFamous 2 is a mostly entertaining game that manages to succeed over its predecessor, Sucker Punch is still yet to make an experience that's genuinely electrifying. Whatever complaints you might make about the ways Infamous 2 could be better, the core of the game is so much fun that it's inarguably worth playing. It's only because the series has so much potential, and already makes good on so much of that potential, that I feel compelled to point out those faults at all. The day we see an Infamous 3 that makes good on everything this series could be, well, that will be an exciting day. Infamous 2 toes a perfect line between too-strong and too-puny, between human and superhuman, between risk and restraint. It halfheartedly delivers on a few of its promises, but its shortcomings are far outweighed by this one stellar achievement: It knows how to make you feel powerful. During its best moments, it feels like something we might have been given by the Assassin's Creed team if they'd grown up immersed in the works of Steve Ditko rather than Umberto Eco: a hard-edged pulp adventure where your tools are perfectly matched to your missions. If the original game gave Cole a purpose, this one provides a little personality to go with it. inFamous 2 compounds on the original. 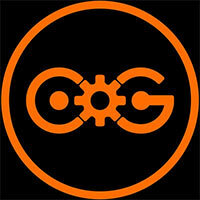 Subtle tweaks, fixes and refinements create an altogether enjoyable experience. The result points to a license not just coming into its own, but one that is moving from strength to strength. inFamous 2 logra reeditar el éxito de su predecesor, algo que era lo mínimo que podíamos pedirle a una franquicia de su potencial. 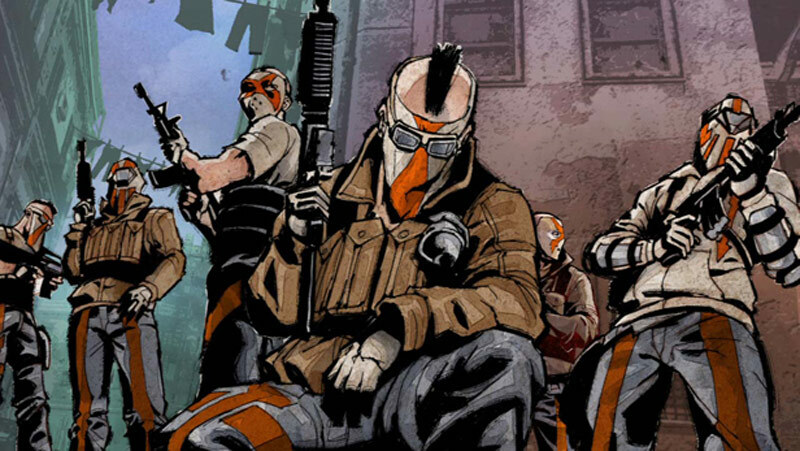 A partir de esa base Sucker Punch construye una experiencia formidable de acción y aventuras, que a pesar de perder algo de la frescura de su primera parte logra un conjunto increíblemente sólido y atractivo. Un videojuego imprescindible para los fans del género de acción y aventuras. Supera las trabas de su antecesor y potencia sus virtudes, en especial el concepto de ser héroe o villano. Acción en tercera persona con altos valores de producción. Tener a nuestro alcance tal cantidad de habilidades permite que tengamos múltiples opciones para afrontar los combates con los enemigos. InFamous 2 podría ser visto elemento a elemento, separando cada una de sus características, evaluándolas y volviéndolas a juntar para obtener una valoración. Visto en conjunto ésta se desvanecería; una vez comenzamos a jugar es muy fácil obviar sus defectos y dejarnos llevar por la contundencia con la que Cole se encarga de sus enemigos. Supongo que no todo se puede evaluar con una barrita de karma. Le premier inFamous était déjà un bon jeu, mais cette suite frappe encore plus fort. Attendez-vous à une aventure encore plus électrique et à des scènes d'action titanesques. C'est bien simple, jamais un jeu dans lequel vous incarnez un super héros ne vous a apporté une telle sensation de puissance. Il ne vous reste plus qu'à choisir de mettre cette force au service de l'humanité ou de privilégier vos propres intérêts. inFamous 2 est l'exemple type de la suite qui a su améliorer la formule du jeu original sans en trahir l'esprit, mais sans complètement régler ses problèmes et sans trop prendre de risques non plus. Plus beau mais encore parsemé des problèmes techniques, plus spectaculaire mais toujours plombé par une histoire et des répliques assez plates, le nouveau bébé de Sucker Punch surprend au final assez peu. Simples e descomprometido mas com profundidade e estrutura para brilhar, inFAMOUS 2 é uma daquelas sequelas que faz muito mais de bem do que de mal. Mesmo dentro de um género popular é algo relativamente único e só é pena que alguns pontos se mostrem ligeiramente inferiores não permitindo um épico. In definitiva inFamous 2 si dimostra dunque un prodotto di ottima fattura, in grado di divertire, appassionare e, cosa ancor più importante, di proporre un'esperienza di gioco completamente unica in base all'allineamento morale che si decide di perseguire. Gli sviluppatori avrebbero forse potuto fare qualcosa in più sul fronte del gameplay, ma ciò non toglie che l'avventura sia sufficientemente stimolante e divertente. Zelfs met die kleine foutjes is inFamous 2 een game om van te genieten. De gameplay is nog steeds een genot en aangezien je keuzes ditmaal echt impact hebben op het verhaal zul je de game met gemak een tweede keer uitspelen. 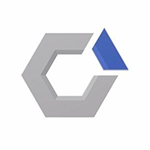 Er zitten een hoop vernieuwingen in de game en door de nieuwe grafische stijl ziet alles er nog spectaculairder uit. Een waardig vervolg dat zeker niet zal misstaan in je collectie.